I nicked, but adapted this recipe from the wonderful Crumbs ladies. Their blog is here http://www.crumbsfood.co.uk but the recipe is from The Crumbs Family Cookbook. I used more chocolate than they have, and swapped honey for golden syrup as I think it’s nicer in biscuits. They turned out v yummy, a slightly chewy, oaty elevenses snack 🙂 And these raspberries were great. From Booths supermarket, and Moroccan. Ethical issues aside they were sweet and juicy and I enjoyed them. UK coffee week ends tomorrow – why not whip up a batch to enjoy with a special lazy Sunday morning? 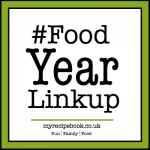 Have a look at some more foodie calendar ideas over here http://myrecipebook.co.uk/foodyearlinkup-may-2015/. These sound delicious. I agree with you about golden syrup in cookies, it’s gives them a lovely chewiness (no idea if that’s a word or if that’s how you’d spell it! ).